Rave reviews from our acquisitions clients! In flat or declining markets the guaranteed offer from Benchmark coupled with a small upside option allowed for better financial security. Plus as any consigner’s collection, with it’s risky volatility, gets reduced in volatility when integrated into Benchmark’s broader, world-wide inventory. The Benchmark team was able to pick up 5,000 bottles in one day and complete inventory in another three days. Thanks to ecommerce, Benchmark can sell these wines in 1 week to two months, whereas an auction house usually needs a two month lead time to publish and market the catalog. I want to report what a pleasure it was to deal with Jeremiah. The inspection went seamlessly. I was most impressed with Jeremiah. He was professional, precise, courteous, tireless, and extremely patient. He worked for 8 hours without a complaint or break. He is a great face for Benchmark. And a nice young man to boot. I bought some wine from you guys this week and the process and service couldn't have been any better. That service extends to my last purchase when I wanted to return/exchange some bottles of Yquem. Kudos to you and your staff! Just following up on the wine sale between myself and Benchmark Wine Group, and first, I want to thank you, Harry, and Oscar for being so professional! You made this an easy process for me, and for that I am extremely thankful! I appreciate the professionalism with which you guys handled the transaction. Look forward to working with you again on both sides of the trade. …next time I'm in Napa I'll swing by and say hello! Your company does great work! Thanks for the letter I received from you along with the very prompt payment for our second sale of wine to Benchmark. I want to express to you how happy we were with your company, beginning with our first phone conversation right up until our payment. Everything was handled in a completely professional, timely and competent manner. Your team went out of their way to make us feel comfortable and confident with our decision to sell to Benchmark. Our first transaction was large — approximately $250,000; the second was a much smaller amount — $13,000. Both times we were thrilled with the service and cooperation we received. We worked with Matt Coelho and then with Jeremiah and Matt from the acquisition team. As I said, everything was handled perfectly. Payment was absolutely as promised. 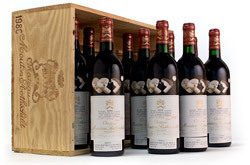 We would have no problem at all recommending Benchmark to anyone looking to sell some of their wine collection. We thank you for the service we received and won’t hesitate to call on you again if we decide to sell more of our wine. My personal recommendation would be to use Benchmark Wine Company in California; they are both an online retailer and have an online auction house Brentwood Wine Company. I have used both to sell some of my wines in the past, and know the CEO, David Parker, as a friend and as a professional. I have never had to question any of their actions, and they are 100% reliable. There is no seller's commission.